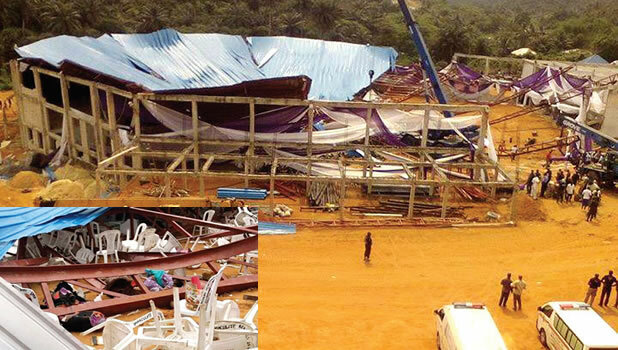 Akwa Ibom Church collapse: NMA Seek Urgent Blood Donations As They Officially Release No Of Persons Survived and Dead. "On behalf of all the Medical and Dental Practitioners under the auspices of the Nigerian Medical Association(MMA), Akwa Ibom State branch, I wish to commiserate with all the families of those who lost their loved ones during and after the collapse of the Reigners Bible Church building on 10th December 2016.I also share in the grief, pains, frustrations and suffering of all the survivors who had incurred one form of injury or the other. Indeed this is a very trying and difficult moment for all of us as our state has never been faced by a disaster of this magnitude with attendant huge casualties. As patriots, we have to rise to the occassion by being our brothers’ keepers and lending a helping hand to those in need. I therefore, wish to sincerely commend all the members of the NIGERIAN MEDICAL ASSOCIATION(NMA), AKWA IBOM STATE BRANCH, for heeding the call to selfless service as expressed in the prompt and timely response that has saved so many lives. The response team led by a past Chairman of the association, DR JOHN UDOBANG,has done a good job in ensuring that victims of this very unfortunate disaster are well catered for and treated at the various health facilities in the state. Reports from the University of Uyo Teaching Hospital(UUTH) show that 21 people were Brought In Dead(BID) , while 2 out of the 23 that were undergoing treatment died due mainly to severe bleeding( One of the victims is reported to have been transfused with 9 pints of blood). I also wish to express our sincere gratitude to all those who have heeded our clarion call to donate blood. More blood is still needed. The number of lives your pint of blood will save can’t be underestimated. I also call on all the survivors who had suffered any form of trauma to report to the various health facilities for proper medical examination as blunt injuries could lead to internal bleeding and avoidable deaths. In conclusion, I assure all the members of the public, that as a responsible and proactive association, we will not rest on our oars until all the lives of the survivors are saved and they are discharged from the hospitals back to their families. Lastly, I pray God to grant the families of all those who lost their lives the fortitude to bear the loss, And may the souls of the faithful departed, Rest In Perfect Peace(RIP).Amen. DR ANIEKEME ANIEFIOK UWAH(JP)CHAIRMAN, NMAAKWA IBOM STATE BRANCH AND SOUTH-SOUTH ZONE."